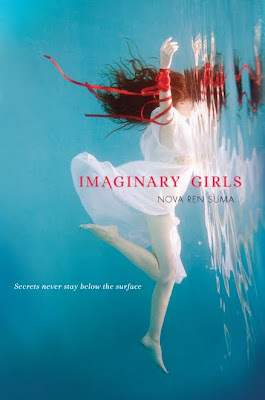 Today, I have Nova Ren Suma here, with a secret about Imaginary Girls. Secret #6: It wasn’t Ruby who lost the ring a boy gave her in the reservoir. It was me. I wrote in that detail about the ring because I thought it said something about Ruby, about how little she cared about most anyone who cared about her. But if I’m being honest with these secrets, losing the boy’s ring in the reservoir is not a random detail I stumbled on out of nowhere. It’s something that actually happened—to me. When I was seventeen or so, a boy who liked me gave me a ring his father had made. It was silver, and something he said meant a lot to him. It was also a little too big for my finger. One day I was with my friends and we took a swim in the reservoir and I remember thinking that maybe I should take off the ring before I went in. But I forgot, and pretty soon there was the moment after I’d dunked my head in when I came up and realized my hand felt light. The ring was gone. I felt around for it in the water, on the rocks at my feet… but it was too late. I couldn’t find it and I had to tell the boy that I’d lost it, and I guess he had to tell his dad. In Imaginary Girls, it’s Ruby who lost the ring to the reservoir, as if she let it slip off her finger on purpose. I’ll admit that I didn’t really want that boy’s ring on my finger, but that’s the difference between Ruby and me. I still feel terrible for losing it. 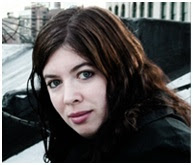 Your first book, Dani Noir, was Middle Grade and Imaginary Girls is Young Adult Fiction. How did you switch the voice to a different audience? What was the most difficult part of writing Imaginary Girls? Sometimes I’m asked about why I switched from middle-grade to YA, since my first published book was the middle-grade novel Dani Noir, and I see why people would think I started in middle-grade and branched off to YA later. The thing is, though Dani Noir was published first and it’s the first image readers may have of me, in fact I started writing Imaginary Girls before it. When I got the opportunity to write Dani Noir, the editor I was working with was at a middle-grade/tween imprint, so I had to keep Dani Noir in that age range. I actually put an old version of the Imaginary Girls manuscript aside to write Dani Noir, and then as soon as I could I picked up Imaginary Girls again. I admit I was worried that I wouldn’t have the chance to publish YA, that I wouldn’t be allowed to write both, but I’m thrilled to see how things turned out. Switching voices between the audiences is really only a matter of finding the voice of my character and staying true to her. Dani in Dani Noir is a snarky thirteen-year-old with a wild imagination. And Chloe in Imaginary Girls is an imaginative sixteen-year-old with a blind devotion to her older sister. I guess what they both share is the vivid imagination, even though they focus on different things. I’d say the most difficult part of writing Imaginary Girls was getting it right. A lot of revision went into this manuscript—a lot of retooling and reimagining and a great many pages were thrown out to find the story that needed to be told. At the time I didn’t know if I could do it—I really honestly didn’t—but I look back on all the months of work from where I sit now and am so grateful I put my all into this. It was the hardest I’ve ever worked on anything, and I love what it became. If you want to learn more about Imaginary Girls, visit Nova on twitter or on her website, you can also read a sample here. Penguin was nice enough to offer a signed hardcover to one winner in the US. If you want to enter, just fill out the form below. Contest ends July 1st. The secrets!!! I was able to read the first half of it bit didn't get the chance to finish it. Nora sounds really awesome and so was the interview! Sarah, Thank you so much for having me here for the IG blog tour—and asking me about my switch to writing for a different audience! And thanks to everyone who entered the giveaway, good luck!